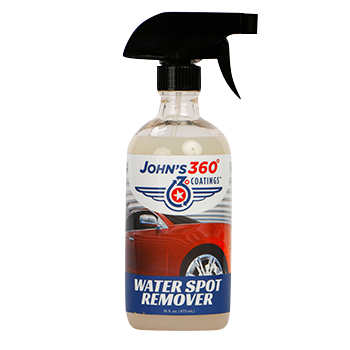 16oz — John’s 360° Coatings® Water Spot Remover is a mild acid solution for removing water spots from painted surfaces and glass. Apply with gloves and for best results follow application with John’s 360° Decon Spray. Stubborn deposits may require additional applications.